People sometimes ask why I like sailing with kids. I always thought that was a funny question. Doesn’t everyone, I thought.. 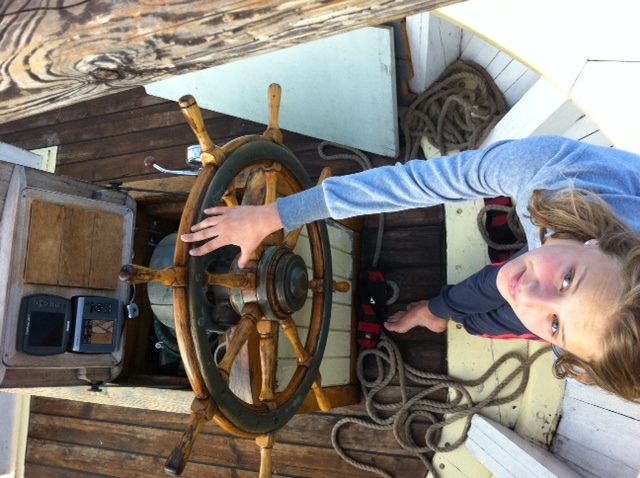 I imagined that all sailors wanted to share what they have with young people so the traditions can live on. For me this is the most important part, because the work, the life, and the attitude is one shared by mariners for generations. For me, the act of passing this tradition is foremost, with the sailing voyage and destination, essential; to making that happen. Sailing south to Neretva for watermelons seemed more like a fun idea at first. But that goal gave purpose to our adventure, and the trip would not have been the same without it. The quest to get to the port on time, meet our hosts, load the melons and return over several days gave reasons for many sailing tasks and skills. On the ship we do not have to search for experience because we are living it in so many practical ways. When the boat needs something, sails to be hauled, anchor to be set, deck to be cleaned, students can see the evident need for these tasks and how they are best done. The time set by the mayor of Ploče for our arrival was the most salient and pressing goal of all. To make sure we were on time, we sailed through the night. Students kept watch, steered the ship and tended the sails. There was never a question of why must I wake up – and of course the students took pleasure in having such good reasons for staying up. Upon our arrival, well in time, and after watching the sun come up after sailing for hours under the stars, the feeling was grand. We were all proud of what we had done. As boaters from Ploče and on the dock waved at us when we entered into the harbor, the students enjoyed being responsible for getting our ship there, how all what they’d done to sail this stout old vessel meant so much. In many other ways the sailing experience is immediately real. They see other crew members working with their hearts, and with compassion for the vessel, using every bit of fiber they can muster, accomplishing what they do almost artfully and in seaman like fashion, which basically means perfectly. Role models become alive. Students see struggle, perseverance and the need for help on the face of fellow crew members. Complaint doesn’t enter their minds. Instead, students learn to teach others what they have learned and ask to try something new. This work ethic, the skills, the songs, the mindset and feelings, all are taught on the deck of the ship, not in a classroom on shore. Returning to daily life, the students’ normal sleep schedules will resume, but they will have part of the ship with them. The hard work, attention to detail, watching out for yourselves and others, taking care of the things you have, conserving water and electricity, keeping your space clean, and seeking out ways that you can help – these attitudes are now part of themselves. It all translates into a rationale of self esteem and self worth that is seen in the faces of any sailor in any sea. Ship and crew are bound together by ties of respect for the environment, each other and the ship itself, and so student sailors become people they are proud to be.